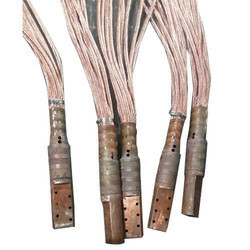 We provide Flexible Copper Conductors for Water Cooled Cables to our clients. More than 90% of the problems with melt systems involve water. Most of this due to restricted water flow in the power leads. IFT has in-house capabilities to make, rebuild or recover all makes and types, as well as to customize a cable for a specific need or application. Under the meticulous supervision of our skilled professionals, we are providing a high quality range of Water Cooled Cables. Water Cooled Cable is a flexible power connection between furnace panel to crucibles. Wide assortment of water cooled cable which stands high on quality parameters and is available at competitive prices. EITEC - France: Incorporated in 2000 in the area of Saint Etienne. voltage, all over the World. We manufacture and supply the entire range of spares for the submerged arc furnace (SAF), electric arc furnace (EAF) and blast furnace (BF). We specialise in the manufacture of heavy and hollow copper castings, and SS and MS fabrications. We also undertake all types of casting, forging, machining and fabrication jobs as per customers drawings. We supply superlative quality Water Cooled Cable & Rubber Hose. Our gamut of water cooled cable is fabricated using premium quality material and is tested to ensure its compliance with set industrial standards. Appreciated for their durability and reliability, our cables are available at competitive prices. Clients can avail from us an extensive range of Cooling Cable at comprehensive rates as per our client’s need. Al these products are made up of premium quality raw material bought from a trustable vendor in the market. Cables are quality tested stringently at each stage of product development to ensure zero defects. These cooling cables are extremely effective and are durable in nature. Water cooled cables are being increasing used where the current ratings are high. Water cooling increases the current carrying capacity of the conductor by almost 4 times in medium frequency furnaces.It is one of the fields in which we excel. 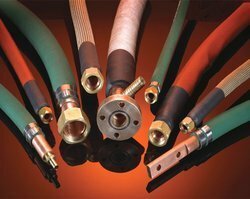 We provide a wide range of good quality water cooled cables that are widely known as water cooled leads. They are well designed for use in furnaces of capacities ranging between 25 kg to 25000 kg. We ensure safety margins like current carrying & cooling capacity. Water-cooled cable is made with high-quality oxygen-free copper stranded wire after cooling extrusion with joints, having good conductivity, mechanical strength, small bending radius and compact layout. The application of flame-retardant rubber on the external surface guarantees the long service life of cable even under hostile environment.